The Old Schoolhouse was built in 1896 by the St. Louis nuns and had separate entrances for boys and girls; upstairs for boys, downstairs for girls. See if you can find ink stains on the original wooden floor upstairs! The accommodation includes a front parlour, sunroom, library, kitchen with Belfast sink, a scullery, two toilets plus a full bathroom, spiral stairs, two bedrooms, living room, balcony, and BBQ area. All appliances on hand, including an AGA cooker. Comfortable accommodation for up to six adults and three children. Relax in old-world charm with traditional styling, stone walls, original wooden floor, two fireplaces, AGA, Belfast sink, and estuary views. Stay in this historic structure for two days or two weeks. All sites along the Norman Way are within an hour’s drive. 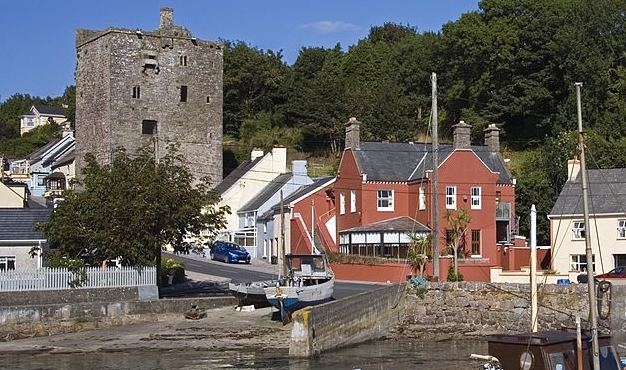 Enjoy nearby beaches, pubs, award-winning restaurants and attractions including, of course, Ballyhack Castle, which stands behind the Schoolhouse. Hop across the ferry to immerse yourself in the history of Ireland’s oldest city, Waterford. Website: Click here to book your stay at the Old Schoolhouse in Ballyhack.